The builders standard bathroom vanities are usually white and drab. Create your own personal escape by adding a sophisticated vanity to your bathroom. A retreat from the everyday to relax and enjoy. Add a counter-top with colour to help reduce the inevitable mess and a medicine cabinet for some extra storage. 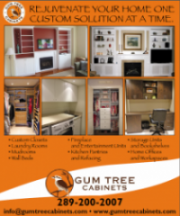 Gum Tree Cabinets can revamp your bathroom vanity helping you create a fresh new place to begin your day! The possibilities are endless and we are here to help every step of the way!